S07xE02 – Trying to make logical sense of Doctor Who is not something that can be accomplished typically. And this episode proved just that in the first five minutes alone. We begin with The Doctor hanging out with Queen Nefertiti in ancient Egypt whilst she’s making the moves on The Doctor (who wouldn’t right?) when he gets a message to meet up with Earth in 2367 (wait they know he’s alive?) where he finds out that there is a spaceship hurtling toward Earth and that if its course can’t be changed they are going to have to destroy it missile style. Of course The Doctor doesn’t like this and decides he’s going to round up a gang (he’s got a gang now. Yes! ), and go check out this spaceship and see what’s up. We next see him in 1902 picking up his old friend Lestrade Riddell (first time we’ve met him, but we are to believe he’s an old friend. This is The Doctor after all). Final stop is the Pond’s home where Rory’s dad, Arthur Weasley Brian Williams just happens to be changing a light bulb, because apparently Rory and Amy are helpless (cue the obvious joke how many Ponds does it take to change a light bulb?) when the TARDIS materializes around them taking all three along for the ride. Next we find “the gang” stepping out onto the spaceship. On a typical spaceship you would expect to see aliens, robots, other humans, pretty much anything but dinosaurs. So what comes running around the corner? That’s right, dinosaurs! Which then precipitates The Doctor’s typical response of “run!” to which he continues to stand in awe of something “cool” and Amy has to drag him back to his senses after he states the obvious “dinosaurs on a spaceship!” Remember kids only on Doctor Who can you have Queen Nefertiti, Arthur Weasley, Detective Inspector Lestrade, Filch and Dinosaurs all in the same place after travelling in a blue police box with a mad man. God this show is great. We watch I believe Stegosaurs (never been good with dinosaurs) barreling down the corridor of the spaceship. The gang is deciding how to handle this unexpected circumstance. The Doctor decides they need to get down to the Engine Room, when boom they find themselves transported to a beach. But is it? First we need to find out if the beach is on Earth, so The Doctor sticks his tongue out and says “it’s not Earth it doesn’t taste right” (of course Doctor why didn’t I think of that?). They then decide that the ground feels more solid than it should and Brian begins to dig with the trowel he always carries with him (you know like you do). They find steel floor under the sand and Pterodactyls start flying around. Turns out the beach is actually the Engine Room powered by the water. Genius! Meanwhile Amy, Nefertiti and Riddell roam the ship and find a computer to where Amy channels The Doctor and becomes the brilliant one of the group discovering the ship is a Silurian ship. But where are all the Silurians? The Doctor, Rory and Brian manage to avoid being eaten by the Pterodactyls and find their way out of the Engine Room. They meet Filch Solomon who has been injured and is looking for a doctor. The Doctor takes on the role of his title and manages to help Solomon to where he can at least walk, but not before Solomon’s increasingly irritating robots injure Brian to get The Doctor to help Solomon. Not a good move. The Doctor doesn’t respond to violence (um…). We find out that Solomon is a treasure hunter and saw the ship had valuable cargo, so he killed all the Silurians and took over the ship. After The Doctor mends Solomon, he is on his way, but not so fast, he still has to figure out how to save the ship from the missiles and Solomon has now noticed that something more valuable is on the ship. Nefertiti. The Doctor has instructed Solomon to leave the ship, which he will do, but for a price. He takes Nefertiti into his custody and begins to leave the Silurian ship, but The Doctor has magnetized Solomon’s ship, because of course Nefertiti isn’t going anywhere with Solomon. The Doctor pulls a few tricks out of his hat, gets Nefertiti back and defeats Solomon sending him on his way without any treasure of any sort. It all seems to have ended happily and they can all be on their way, but what about the missiles? They’ve already been launched, so The Doctor reroutes their signal and aims them at Solomon, killing him. The Doctor justifies this to be for the greater good and they all hop into the TARDIS. The Doctor begins to take everyone home, and Nefertiti decides she is going to shack up with Riddell in 1902 (thus explaining her disappearance that plagues the history books), and Amy and Rory ask to go home for a couple months. Brian has a request before they head back home, and you wrap up the episode with Brian sitting on the edge of the TARDIS drinking tea in space, *tear*. 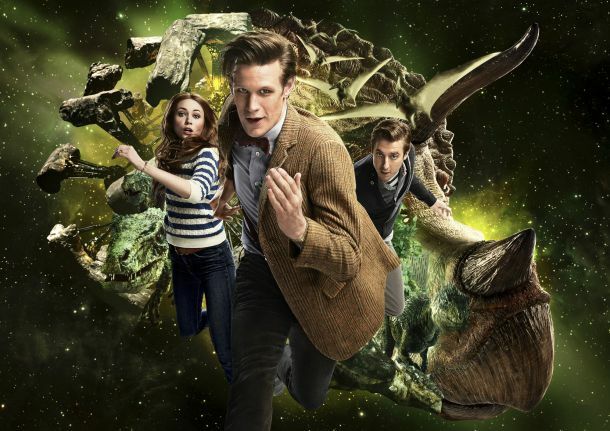 Best of the episode: The Doctor, Rory and Brian riding a triceratops to get away from the annoying robots. And how do you start a triceratops? By throwing one of Brian’s balls (golf balls that is) for Tricey to chase. Worst of the episode: The fact that The Doctor killed Solomon. I know he’s killed before, he even killed his entire race, but for some reason this resonated with me. I didn’t feel it was entirely necessary, and he could have found another target for the missiles. Where did this episode leave us? : It left us wondering why the Ponds wanted another couple months at home before travelling with The Doctor again. It also left us wondering if killing Solomon will have any future impact. I doubt it will, the whole thing seemed so casual and like it really didn’t affect the outcome of anything. But with Doctor Who even the most insignificant thing can surprise you and end up being much larger than you thought. Only time will tell (pun intended). What the episode ruined for us: The chances of having another Doctor Who, Harry Potter and Sherlock mash-up is slim to none. 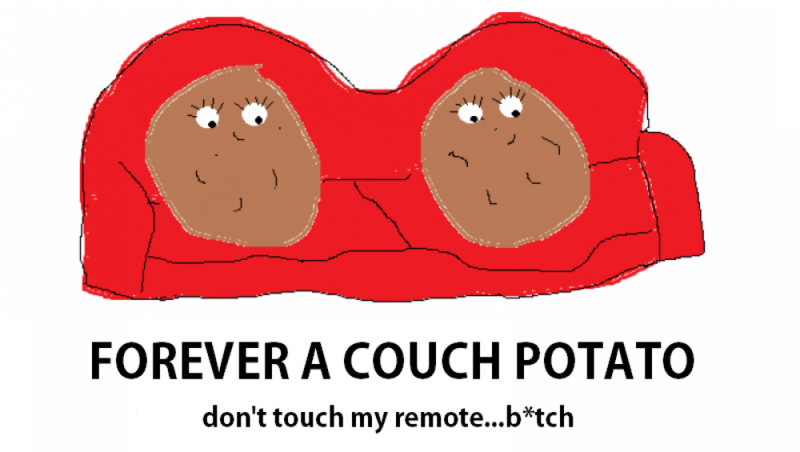 This entry was posted in Doctor Who, TV and tagged Doctor Who, TV by foreveracouchpotato. Bookmark the permalink.